Blogging is dead. That’s what they keep saying. Facebook and Twitter are stealing readers. The business model of blogging, once a veritable license to print money, is broken, perhaps hopelessly so. The days of blogging magnates building obscenely opulent castles and other monuments to their own egos — they are nearing the end. I know. It’s hard to believe. But even the big boys are in trouble. BikeSnobNYC is hemorrhaging money. Analysts expect a bankruptcy filing any day — or perhaps a paywall — as sales of its flagship product, “Blend of Disapproval” Coffee, have plunged. Indeed, while BikeSnob was dithering, he failed to notice the world changing around him — you know, tastes turning to … tea. And don’t be fooled by the ads plastered all over BikePortland.org. It’s nothing but a desperate ruse to appear vibrant. They are practically giving them away. Revenues have plummeted. Mass layoffs are inevitable, which is especially worrisome at an organization of one, perhaps two, people. The changes in publishing today make Johannes Gutenberg’s introduction of movable type in the 1440s seem quaint. So, we have a sad but necessary announcement. Eugene Bicyclist, in order to survive, must change. Beginning May 1, there will be no blog, no commenting, no smart-phone optimized site, no Facebook “likes” and certainly no Googling us. You will, instead, wait patiently in your slippers with a gin and tonic and watch your mailbox — at least until your postal carrier is laid off. 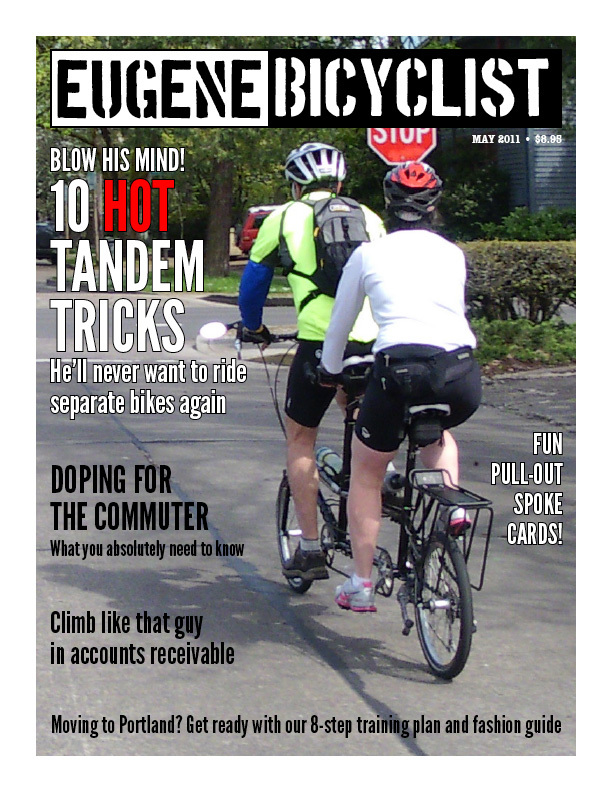 You will be waiting, of course, for the latest copy of Eugene Bicyclist magazine. Yes. We’re going to paper, dammit. Lots of it. Whoa. $8.95. Them’s some color glossy photos of hot tandem action. Almost worth it though, for the pull-out spoke cards. Eugene Cyclist, you’re just 25 days late with this post, right? Not as late as I am with most things. I’m looking forward to the big Milk Crate issue – I think Darigold is really going to wow us this year. When’s the unicycle mountain touring issue? You are a trailblazer. My check (for a charter subscription) is in the mail. Good, ’cause PayPal is totally off the table now, too! ← Cyclist comes out of nowhere, breaks SUV’s side mirror with his back!